The shoes are amazing! I wish I had ones like these! i love your shoes – they are gorgeous, especially their colour! Love your today´s look. I´m in love with that shoes since I saw them in the H&M catalogue!! thats such a nice outfit! love the long stripe dress with the coat! Oh red shoes, looks amazing! love this look! the shoes are great! you look fab !the jacket I love. i love the leopard jacket!! Delance!! we love you .. thanks for follow us .. we try many times to suscribe to your community but we cant if you can help us !! please let us know .. sorry about my english !! WOW! LOVE YOUR OUTFIT, THIS COAT AND THESE SHOES ARE FABULOUS!! i adorrrre these shoes! 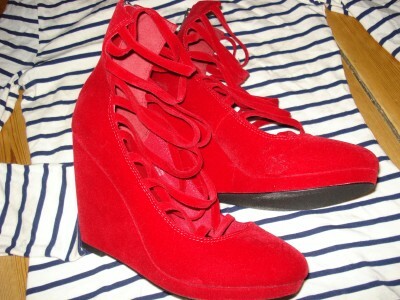 i totally have a thing for red shoes- can’t get enough!! The wedges are so cool! i am absolutely CRAZY over the red shoesss!! !